Henri Du Mont was a key figure at the court of Louis XIV. Born in Flanders in 1610, he moved to Paris in his late twenties. From 1643 until his death in 1684 he was organist at the Jesuit church of St Paul in the Marais; in 1672 he was appointed Compositeur de la musique to the chapel royal, having been a sous-maître since 1663, and he became Maître de la musique to the queen a year later. 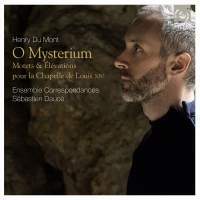 This admirable recording consists of five grands motets and six élévations or petits motets, all but one published in the 1680s. There is also an instrumental piece, the ‘Allemande grave’ from Du Mont’s first published collection, the Cantica sacra of 1652: euphonious, beautifully played, with the bassoon pleasantly prominent in the middle of the texture. The accompaniment in most of the élévations is for continuo only. In Ave regina, however, a solo violin can be heard above the all-female vocal lines. Desidero te millies and Quam pulchra es are two other petits motets that dispense with men’s voices. Both feature ear-tickling suspensions in the harmony; Caroline Weynants and Caroline Dangin-Bardot are particularly expressive in the latter. Sub umbra noctis profundae for solo bass is sung with due solemnity by the deep-voiced Nicolas Brooymans. Sébastien Daucé’s direction is lively and sensitive, and the recorded sound is exemplary.